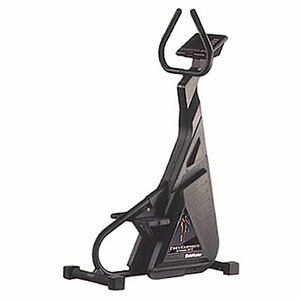 Upright rail-less configuration encourages an improved exercise posture for the best lower-body workout of any climbing machine. Patented, independent pedal geometry ensures safe, biomechanical correct movement. New computer console motivates you during your workout with different program options and workout statistics. Speed control buttons allow you to increase or decrease the intensity of stepping action at any time during your workout. Space-saving design fits in less than 2’x 4′ of floor space. Electronically controlled brake precisely controls the pedal descent from 26 to 174 steps- Includes Polar Heart Rate monitor capability.